A long-running rift in the Larsen C ice shelf grew suddenly in December and now just 20km of ice is keeping the 5,000 sq km piece from floating away. Larsen C is the most northern major ice shelf in Antarctica. Researchers based in Swansea say the loss of a piece a quarter of the size of Wales will leave the whole shelf vulnerable to future break-up. Larsen C is about 350m thick and floats on the seas at the edge of West Antarctica, holding back the flow of glaciers that feed into it. Researchers have been tracking the rift in Larsen C for many years, watching it with some trepidation after the collapse of Larsen A ice shelf in 1995 and the sudden break-up of the Larsen B shelf in 2002. Last year, researchers from the UK's Project Midas reported that the Larsen C rift was growing fast. But in December the speed of the rift went into overdrive, growing by a further 18km in just a couple of weeks. What will become a massive iceberg now hangs on to the shelf by a thread just 20km long. "If it doesn't go in the next few months, I'll be amazed," project leader Prof Adrian Luckman, from Swansea University, told BBC News. "There hasn't been enough cloud-free Landsat images but we've managed to combine a pair of Esa Sentinel-1 radar images to notice this extension, and it's so close to calving that I think it's inevitable." Prof Luckman says the area that will break off will be about 5,000 sq km, a size he says that would put the iceberg among the top 10 biggest that have been recorded. The researchers say that this is a geographical and not a climate event. The rift has been present for decades, they say, but it has punched through at this particular time. 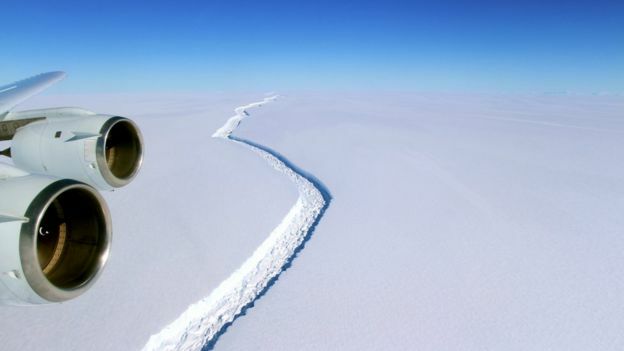 It is believed that climate warming has brought forward the likely separation of the iceberg but the scientists say they have no direct evidence to support this. 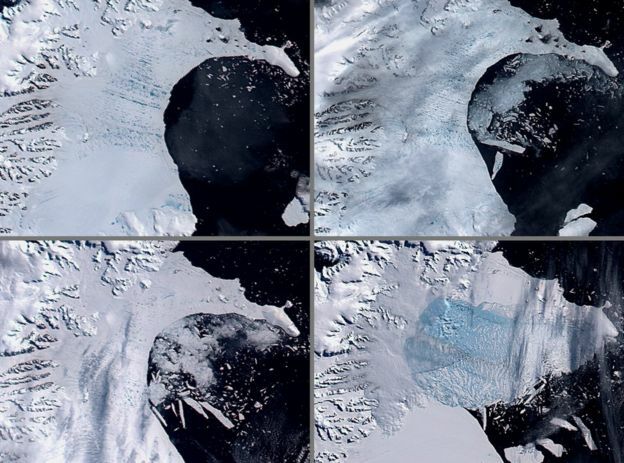 However, they are concerned about how any break-off will impact the rest of the ice shelf, given that its neighbour, Larsen B, disintegrated spectacularly in 2002 following a similar large calving event. "We are convinced, although others are not, that the remaining ice shelf will be less stable than the present one," said Prof Luckman. "We would expect in the ensuing months to years further calving events, and maybe an eventual collapse - but it's a very hard thing to predict, and our models say it will be less stable; not that it will immediately collapse or anything like that." 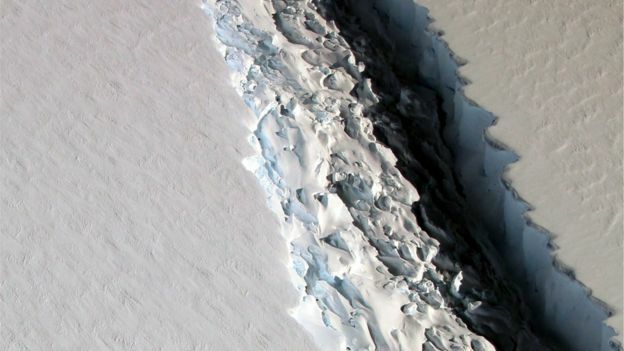 As it floats on the sea, the resulting iceberg from the shelf will not raise sea levels. But if the shelf breaks up even more, it could result in glaciers that flow off the land behind it to speed up their passage towards the ocean. This non-floating ice would have an impact on sea levels. According to estimates, if all the ice that the Larsen C shelf currently holds back entered the sea, global waters would rise by 10cm. All that is very much in the future. There are few certainties right now apart from an imminent change to the outline of Antarctica's icy coast. "The eventual consequences might be the ice shelf collapsing in years to decades," said Prof Luckman, "Even the sea level contribution of this area is not on anybody's radar; it's just a big geographical event that will change the landscape there."